MONTGOMERY, Alabama – Trevor Watson Parrish has been named a legislative policy coordinator for the Business Council of Alabama, BCA President and CEO William Canary announced today. Parrish began his duties on Aug. 1. He will report to Victor Vernon, BCA Vice President for Public Policy. “Trevor has strong legal and research skills that should translate into him becoming an immediate contributor to the BCA’s Intergovernmental Advocacy Team,” Canary said. Parrish comes to the BCA from the Alabama Law Institute where he drafted legislative analyses of proposed bills and provided legal support during meetings of the Boards, Agencies, and Commissions Committee of the Alabama House of Representatives. Parrish is a 2009 graduate of the University of Alabama majoring in history. He attended the Florida State University College of Law and received a Juris Doctor degree in May 2013. His course work was focused primarily on business and corporate law, and he received a certificate in business law alongside his degree. While in law school, the Prattville native clerked for the Florida Department of Business and Professional Regulation, completed an internship with the U.S. Bankruptcy Court for the Northern District of Florida, and interned with the Florida Attorney General’s Criminal Appellate Division. Parrish was admitted to the Alabama State Bar and lives in Montgomery. 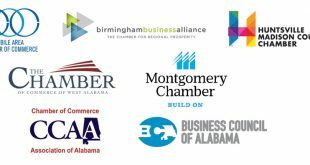 The Business Council of Alabama is Alabama’s foremost voice for business. The BCA is a non-partisan statewide business association representing the interests and concerns of nearly one million working Alabamians through its member companies and its partnership with the Chamber of Commerce Association of Alabama. BCA is Alabama’s exclusive affiliate to the U.S. Chamber of Commerce and the National Association of Manufacturers.